Pinnies to separate kids into two teams. Cones to mark safe zones. 2 containers to hold beanbags. Split the kids into two even teams. The team in the pinnies are the witches. The team without the pinnies are the kids. Create a safe zone, with cones, that is about 8 feet by 8 feet. Put the container with all of the beanbags inside. At a far distance from the first safe zone, build another one of the same size, and put the empty container inside of it. Have all of the kids start inside the safe zone with the empty container. Tell them that the witches have stolen all of the kids’ Halloween candy, and it is up to them to get it back! The witches are not allowed in either safe zone. The minute a kid leaves a safe zone, he is in danger of being tagged by a witch. If you get tagged by a witch, then you must go to prison. The only way to be saved from prison is someone from your team must make it to you, link arms with you, and then walk you back to your starting safe zone (if they are tagged by a witch while trying to make it to prison then they must go to prison too). The kids are trying to get as many beanbags back to their safe zone as possible. They are safe while they are in either safe zone. You can have as many kids in a safe zone at a time as you want. Kids can only steal 1 beanbag at a time. 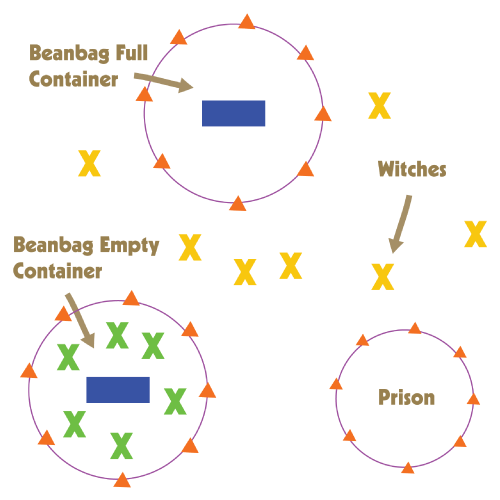 If they are caught by a witch while trying to get back to their safe zone with a beanbag, then they MUST return the beanbag to where they stole it from before going to prison. Play for a predetermined amount of time, and then have the kids switch roles. Whichever group of kids steals more beanbags wins.